Waseem Badami Reciting "Aey Sabz Gumbad Waale" at Arafat will Give You Goosebumps! Muslims have faith plus they all pray, fast, pay charity and also go for hajj declaring that there is no God worthy of worship but Allah and Muhammad (PBUH) is his messenger. 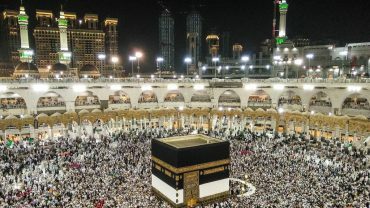 Hajj is a very spiritual pinnacle for all the 1.8 million Muslims around the globe where Muslim pilgrims are known as Hajis embark on a 5-day pilgrimage while being wrapped in a white cloth (Ahram) for their submission to the will of God. Tears keep falling down their eyes as they praise the Almighty Allah and ask for forgiveness which also denoted unity for his sake. They all wear the same simple clothing, say the same words, follow the same rituals and stand at the same place for their devotion to God. This year, Waseem Badami, who is a Pakistani journalist and also a news anchor went to perform Hajj along with his mother. Besides his show 11th hour, the audience has several times experienced Mr. Badami reciting different naats on his Ramadan transmission that get a lot of people all teary, but now he has not only captured the beautiful moments of Hajj but also recited them in words through a naat “Aey Sabz Gumbad Waale”. This naat also brings back all the memories of the late Qawal, Amjad Sabri, who recited it few hours before he was shot to death. The recitation by Waseem Badami can give anyone goosebumps along with that the naat itself phenomenally describes everything in words. May all his prayers and Hajj be accepted. Let us know in the comment section down below as to what do you think and don’t forget to like and share it.